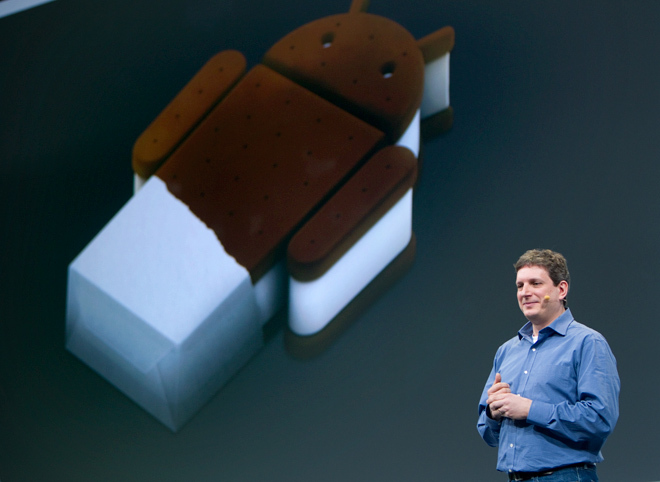 After months of anticipation and leaked software screen shots, Google finally unveiled Android 4.0, also known as “Ice Cream Sandwich,” the latest update to the search giant’s Android mobile platform. The new operating system should eventually merge Android’s tablet OS (version 3.0, aka Honeycomb) with the platform’s smartphone OS (version 2.3, aka Gingerbread). Dubbed Ice Cream Sandwich, the unified OS isn’t an incremental update, but rather a complete OS makeover with changes that range from the elimination of physical navigation buttons to the creation of an entirely new font, “Roboto,” for user interface menus. Among other improvements, Ice Cream Sandwich brings a slew of enhancements to Google’s proprietary applications, including incognito browsing and Chrome bookmark syncing on your mobile phone. An improved Gmail app boasts better auto-completion of e-mail body text, auto-programmed quick responses for when users are busy, and nested e-mail sub-folders for easier organization. In one of the most innovative new attributes nestled inside Ice Cream Sandwich, Google offers “Android Beam,” a new feature specific to the Near Field Communications technology found in a handful of Android handsets. Beam allows Samsung Galaxy Nexus smartphone users to share content between their phones, simply by tapping the devices together. So, for example, if you’re reading an article on your browser, tapping your phone to another Galaxy Nexus brings up the same page on your pal’s phone. And Android Beam communication even extends to apps: As Android product manager Hugo Barra showed off in a live demo, if one user is playing a game of Minecraft on his phone and taps his Nexus to a second Nexus, the receiving phone’s U.I. will spawn a download link for Minecraft on Android Market. Google also debuted an exciting (if not a bit scary) OS feature for enhanced security: Face Unlock. In theory, the new OS uses facial recognition technology to recognize whether a phone’s owner is actually holding the phone. So, if a thief tries to open your phone’s lock screen, the camera will recognize his or her face as that of an interloper, and shut out the would-be intruder. Google’s on-stage demo of this feature didn’t work as planned, so it’s yet to be seen how well Face Unlock will function once Ice Cream Sandwich and Galaxy Nexus phones are deployed. As has been the case with earlier Android software releases, Ice Cream Sandwich will launch strapped to a flagship “Nexus”-branded device manufactured by Samsung. And thus we have the new Galaxy Nexus. “Our close alliance with Google has played a major role in Samsung becoming the number one Android smartphone manufacturer in the world,” said Samsung president J.K. Shin at the event. Currently, the Korean company sits at the top of the heap of Android smartphone makers, selling over 30 million Galaxy devices to date. In addition to the fresh version of Android installed on the phone, the Galaxy Nexus spec sheet checks off all the important boxes. The new phone is powered by a 1.2GHz dual-core processor backed by 1GB of RAM, and coupled with 16GB of on-board storage (expandable via microSD to 32GB). In terms of its displays, Samsung errs on the side of massive: The Galaxy Nexus comes equipped with a 4.65-inch, 1280×720 super AMOLED screen — supplied by Samsung, of course. “Android 4.0 was designed specifically to work with this resolution,” said SVP of mobile product innovation at Samsung, Kevin Packingham. Not too shabby, Samsung. 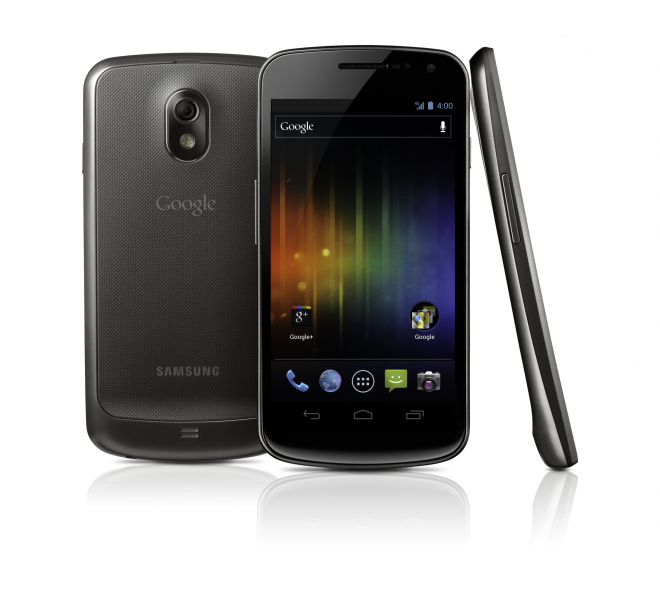 The Galaxy Nexus will also come in a 4G LTE version, though no information on which U.S. carrier support was announced. Samsung president Shin says that if consumer demand warrants it, the Nexus Galaxy will also come in an HSPA+ version. The new device also comes equipped with the usual image-capture suspects: front- and back-facing cameras at 5 and 1.3 megapixels, respectively. Packingham says the camera should shoot pics with “zero shutter lag,” and is capable of taking shots in low-light settings. Bluetooth capability, an accelerometer and GPS are, of course, all standard features in the Galaxy Nexus as well. The Android announcement comes on the heels of multiple recent software updates across competing mobile platforms. On Tuesday, RIM announced the next generation of its BlackBerry smartphone software, BBX. HP also recently issued a software update to its webOS customers — despite expressing that the company would no longer continue producing webOS-powered hardware in the future. (Bizarre? Yes. ) And, of course, Apple just released the much-anticipated update to its mobile software, iOS 5. Compared to the RIM and HP announcements, Google’s Ice Cream Sandwich release is relatively monumental, and brings a host of new enhancements to the platform’s interface, including a number of features seemingly borrowed from other platforms. Android “Beam” is highly reminiscent of webOS’ “Touch to Share” feature, while a simple screenshot-snapping function was perhaps inspired by a similar iOS feature that debuted long ago. Even Android’s revamped tile-based organization for contacts seems to be inspired by Microsoft’s Windows Phone Mango. The Galaxy Nexus will launch in the U.S., Europe and Asia this November (just like the Motorola Razr, which debuted the day before), and will roll out globally gradually.